Explore the gorgeous works of art in Florence's Uffizi Gallery during this small-group tour. See all of the most important pieces in the museum's collection with your guide to lead the way. Meet your guide outside gate number 3 (the reservation entrance) 15 minutes before the scheduled tour time. Bring cash to pay your guide for the museum tickets upon arrival, as they are not included in the price of this tour. Walk through historic halls and rooms that were once used as the government offices for the Medici family. Admire the large Botticelli paintings, 'Birth of Venus' and 'Primavera,' up close. See Leonardo da Vinci's exquisite 'Annunciation,' as well as the eye-popping color in Michelangelo's only surviving panel painting. Other works of art on display in the Uffizi include pieces by Raphael, Titian, and Caravaggio. 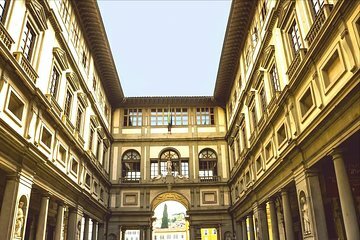 This 2-hour tour gives you time to see all highlights of the Uffizi Gallery. Please note: Admission tickets to the Uffizi Gallery are not included in the price of this tour. You will pay your guide in cash for tickets when you arrive at the appointed meeting place. We have been to Venice 3 times before and this time we had friends that had neither been or had only a brief time in the city. I loved how the tour was focused on seeing the scene behind the scenes. We saw the quieter more simple side and very few other tourists to battle for space. Make it a priority the next time you visit.